The Cincinnati Bengals are a bad football team. Considering it took a miracle pick six at home to beat an atrocious Colts team, I feel pretty confident in that statement. 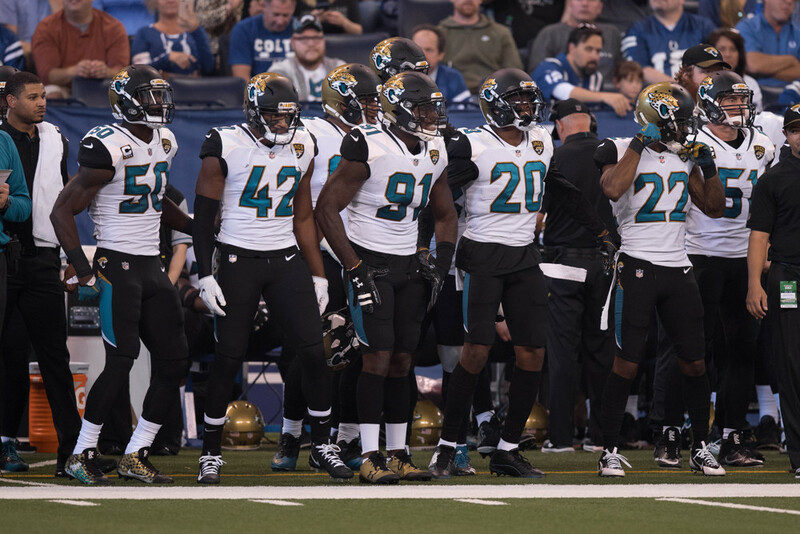 That's excellent news for the Jacksonville Jaguars, whose defense has feasted on bad teams for massive fantasy days on the way to the top spot in the fantasy defense rankings. Their pass defense is a full 20 yards better than the next best team, meaning that opponents have to run the ball to score points. I'm guessing you can see where this is going, but the Bengals have no rush attack and are averaging only 78 yards a game. Add in a couple classic Andy Dalton turnovers and you are looking at huge fantasy day for the Jaguars defense. The Eagles have been a consistent source of fantasy points on defense. They are in the top 5 in fantasy points scored, and their 14 takeaways are good for 5th in the league. However, outside of the fantasy realm, they are only an above average unit thanks to their rush defense. The good news is, this week they play the Broncos, who just benched their starting quarterback for a player who got cut by the Browns. It's unlikely that the Broncos will be able to pass their way to points, meaning points will be tough to come by. This may not be the highest upside matchup for a defense this week, but it definitely presents the highest floor, and the Eagles should be used in all leagues. Choosing the right fantasy defense usually comes down to matchups, and as far as matchups go, it's tough to do better than the Indianapolis Colts. They are bottom 5 in yards per game, bottom 8 in points per game, and are giving up a painful 5 sacks each week. I legitimately feel bad for Jacoby Brissett, the guy is getting hit on almost every passing down. Houston's defense has lost a lot of its luster after the JJ Watt injury and are allowing the 4th most points in the league, but they shouldn't have much trouble corralling the Colts offense and adding a couple turnovers. Since Houston's D is probably available in your league, they make a great streaming option if your primary defense is facing a tough matchup. Buffalo's defense gives up a lot of yards, but in most leagues, yards allowed don't matter. All that matters is points allowed, turnovers created, sacks and touchdowns. The Buffalo Bills have been exceptional at two of these aspects. They allow the third fewest points in the league, and they are tied for the league lead in turnovers created. Those stats make Buffalo a pretty good matchup against most teams, but the Jets are the 5th most turnover prone team in the league, meaning that the Bills' defense is sitting pretty for fantasy points. Considering Thursday night games are notoriously sloppy, Buffalo is an excellent choice for a week 9 defense. Full disclosure, I am a Detroit Lions fan, and I have alreadywitnessed the Lions make a Green Bay back up quarterback 10 million dollars.So I want you to know that I don't make this recommendation lightly. But Brett Hundley has thrown for a combined 247 yards in the two games, and has looked completely overwhelmed as the starting QB of the Green Bay Packers. The Lions haven't been a particularly good defense, but they force turnovers and should be able to make the Packers one dimensional. I'm betting Bret Hundley isn't able to win the game, and coughs up the ball in the process making Detroit a top 5 choice for defense this week.